Since this thread now is closed I make this new thread to allow us to ask a few questions. To kick it off, here are my questions. a) What is a main village? Do you mean a capital? b) Assuming that you mean main = capital .... what the **** is going on? Obviously you cannot remove the option of making your 15C your capital? .... I'm speechless. c) Sheila could you please promote to the community to go and vote in the [Farmer Building] - Vote for 15C game mechanic thread? Some times the community may in fact have some good ideas.. Sorry for appearing as an annoying complainer attempting to back-seat drive.. its your game. But don't you see that removing the option of making a cropper your capital removes 90% value of a cropper? You have previously stood your ground saying that 15C's should be something rare and highly contested... this new idea goes directly against this statement. I'm also kind of confused to why you choose to name it "main" instead of capital, and why you closed the thread. Anyway, speaking out of frustration, please excuse me. Thank you again for the valuable feedback and lively discussion. We evaluated all your feedback internally in a couple of brainstorming sessions and meetings. If we will go further with this concept, we already decided on reducing the PvE approach and on keeping some empty 15c fields on the map. We will close this discussion because your feedback changed the concept completely. It makes more sense to discuss the new iteration in a new thread as soon as it has matured more. For now, we only need you to answer one last question. Help us by taking part in the poll on the left. 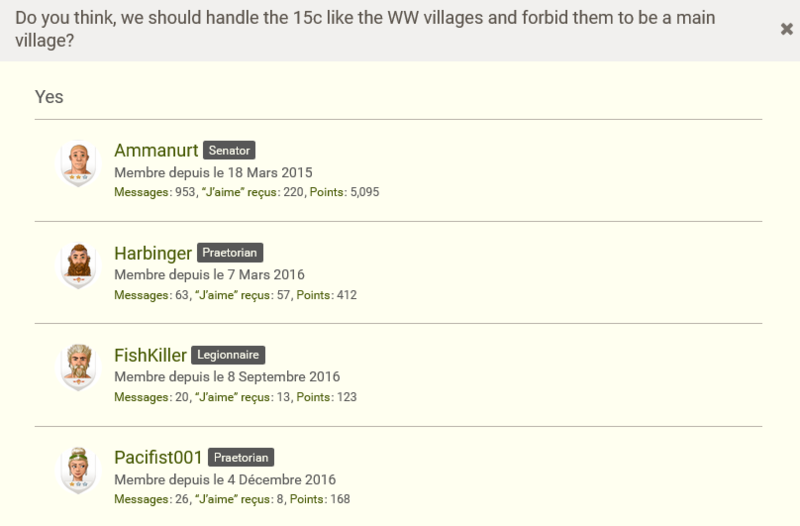 Some of you already addressed the topic of having the 15c as main village. There are some good reasons for handling them like WW villages and forbid them to be main villages. On the other hand, that might be too harsh of a limitation for players. The post was edited 3 times, last by Scorox ( Feb 7th 2019 ). i thought many players resisted those ideas but it seem to me that all our comments were manipulated in a way to make them look positive. Are they still going forward to test it and stuff? Its a translation mistake. In german Capital = Hauptstadt. The word "Haupt" = main. So they get confused by the language i think. Like i have said in a few other threads about this topic......seems like they(Travian) took all of the worst ideas and are pushing forward with them. Not sure why they dont start with fixing fast settling by making 15c's cost 2x CP's (like cities) and 9c's 1.5x CP's.... basically if you want to settle a 15c early it will cost you 2 CP slots and settling a 9c would cost you 1 CP slot PLUS half the CP needed for the next slot.....I mean this game is run by math. All that would be needed is some new wording in your Res/Palace to accommodate the change. "yes it is, no you can't"
Why not simply make beginner protection end once you settle a second village? I don't think there is anything wrong with the fast settle strategy in itself. I think there are sacrifices being made to execute it. So I think that by removing beginners protection, the player just has to live with their sacrifices. Maybe it wouldnt matter? I love this idea. It is easy to implement and I think it would solve most problems, also allow us to leave beginner protection early if we want. But why vote "Yes" then ? Not so funny if it happens to oneself, is it? I know I shouldn't write this, but I just couldn't resist, sorry. a) Main village = Capital, translation error, like QuamWave mentioned. Also I think I saw it every now and then when looking through some ajax requests to find some translations for my toolpage, so maybe they call it like this internally. b) Ikr, it's a harsh change. But she presented it nicely and since almost nobody voted for yes, they will probably know, that a significant amount of people don't like the idea. Not sure why this was worth a thread on its own. c) Not adressed to me. This topic makes me curious though. How exactly does the gamedesign imagine this game to be played? Or, to be more specific, how exactly is it supposed to be played according to their thoughts? Are they intending the changes, they cause? Or are they just coincedental? Maybe one should write them a guide on how the game is currently played. I mean, no offense intended, but from what I know, GD could be doing some maths, calculating roughly "hm, ok, an average 15c has level 14 fields, who builds a second warehouse anyway, and 75% crop bonus, this makes 30k production with plus. If we forbid 15c capitals, it's still 25k production with all 14 and three 25/25% oasis. hey, it's not that bad and peopls complain about 15c being pay to win anyway all the time, come on, let's do it". I mean, I'm quite sure, that nobody from TG expected rubble-settling or menhir-settling to become a thing after the corresponding changes. Hm, I just realized, that I would be very interested in a official TG video in which they show the steps and thoughts an idea / game change / design idea / whatever in depth and detailed. because i like the way that everything should be possible to maximize the possible options to increase difficulty and fun. nobody should feel safe and very active people should benefit more than people who just idle troops etc on their cap and go afk for days, this should be punishable. I'm writing to let you know that the team is not going to go forward with the idea of limiting 15c villages as the vote of the players clearly shows they wouldn't like to see this implemented. Additionally please do not get worried instantly if the team asks a 'controversial' question or something that you are strongly against, just voice your opinion in a polite manner and it will surely be taken into account!